Jake & Jubi's Snack Co. offers radically simple, fruit sweetened snacks. All products are a blend of wholesome, grain-free and dairy-free ingredients, such as dates, nuts, coconut and coconut oil. Whether it’s the Date Bites, Nut Crunch, or Granola Butter, our handsomely imperfect snacks prove that real food ingredients can satisfy even the pickiest taste buds. Simple, yet sinfully sweet, and better-for-you treats. Surprisingly delicious, these dessert bites are made with only six whole food ingredients. Loved by kids because they are reminiscent of cookie dough, adults will find guilt-free pleasure in them as well. if this ain’t in heaven, i don’t wanna go. Nut Crunch is a versatile mix that can be used as granola, cereal, ice cream topping, or a straight-up snack. 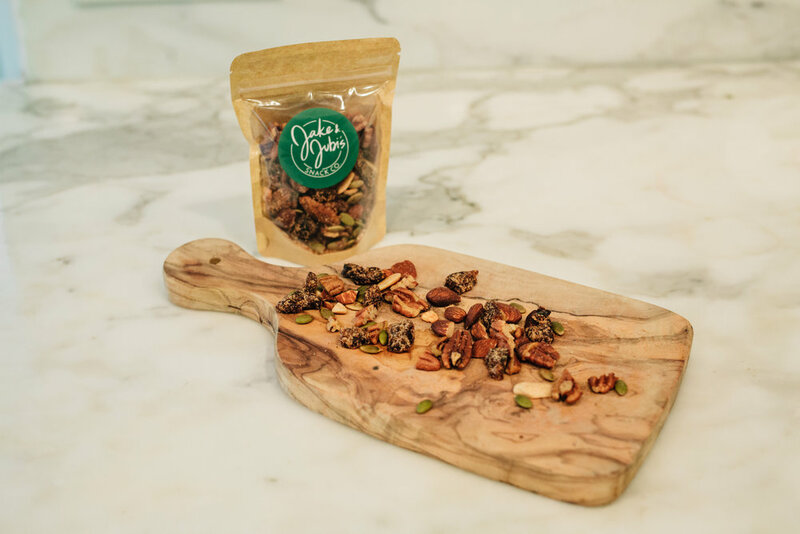 This delicious snack is handmade in Austin by roasting a hearty mix of nuts, seeds, and fruit in coconut oil. It’s the perfect balance of sweet and salty.